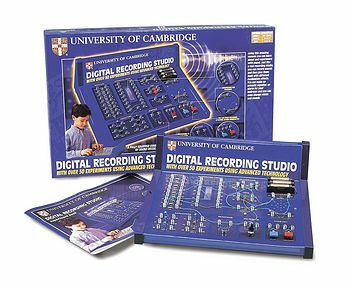 Children's DIGITAL ELECTRONICS KIT: including Digital Recording Studio circuit! 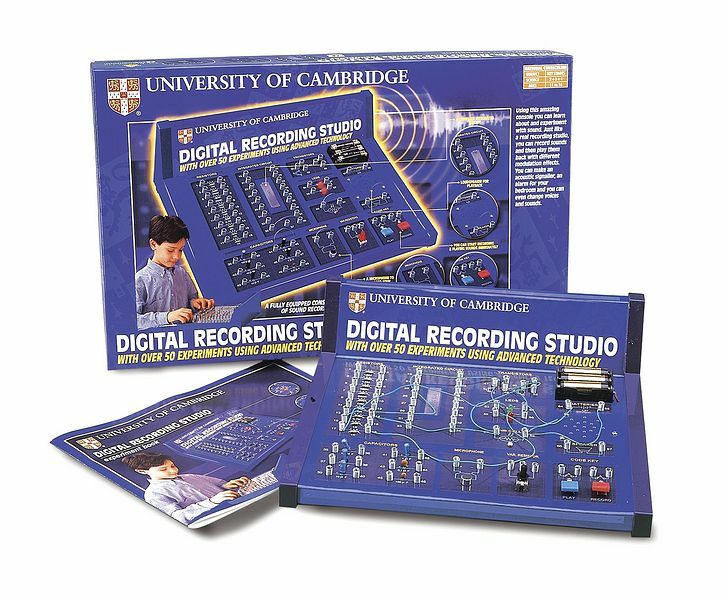 Our Digital Recording Studio from the University of Cambridge range of Science & Education learning toys makes an ideal gift for the more inquisitive child, encouraging learning through playing and sparking the imagination. The set comprises a fully-equipped console to learn the principles of sound recording and modulation. The University of Cambridge has produced some of the best scientists of all time, from Isaac Newton and Darwin, to Stephen Hawking, and you can be sure that they have only given their name to these great science sets because they truly reflect the University's unrivalled reputation for scientific achievement and excellence. Suitable for 10 years old and above. Using this amazing console you can learn about and experiment with sound. Just like a real recording studio, you can record sounds and then play them back with different modulation effects. You can make an acoustic signaller, an alarm for your bedroom, and you can even change voices and sounds! A fully-eqipped console to learn the principles of sound recording and modulation. Includes a comprehensive workbook detailing over 50 experiments, a complete digital integrated circuit, loud speaker and microphone. Requires 3 x AA batteries (not included). Famous Scholars: Frank Whittle was only 21 when he first mentioned his idea of turbo-jet flight to his employers at the Air Ministry. They did not show any interest and a patent he had taken out lapsed, as he did not have the funds to renew it. However, in 1934 the RAF sent him to Peterhouse (Cambridge University) as a mature student where his new ideas were encouraged. When he left Cambridge, having obtained a first in Mechanical Sciences, he set up a company called Power Jets to develop his jet engine. The first test flight took place on 15 May 1941, and lasted seventeen minutes, having achieved a top speed of 370 mph.